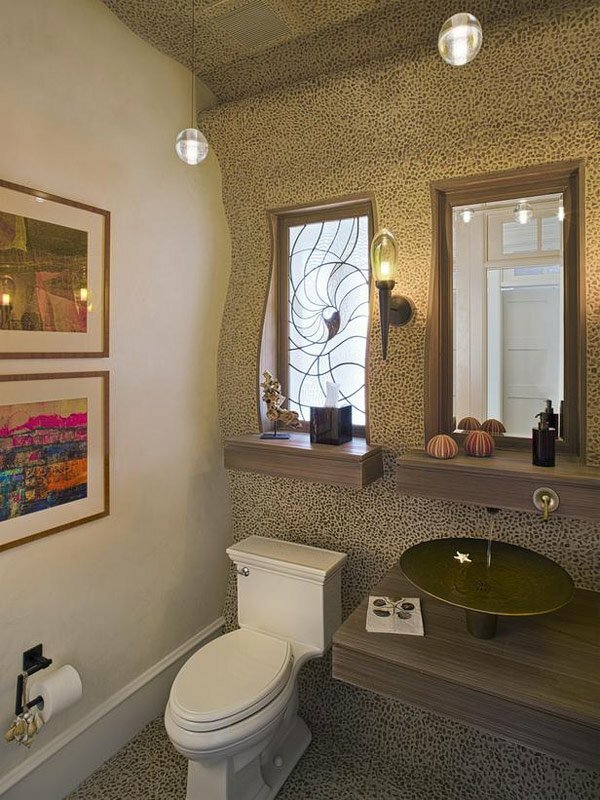 Who says that bathrooms would not be as nice-looking as other rooms of your home? This area only needs proper decorations and fixture that will make it beautiful and appealing. 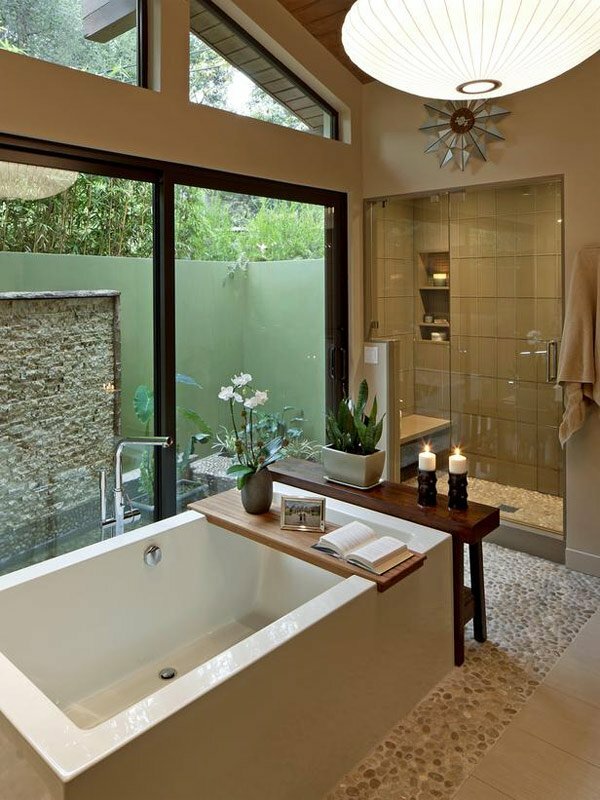 One that gives life to your bathrooms is the windows. Yes of course, but only if these windows are dressed or decorated attractively. Dressing up bathroom windows does not merely add some decor but also permits the much-needed privacy, which is a huge consideration. Through this idea you can boost the style quotient of your bathrooms, not just that, it may tolerate the temperature and humidity of this room. 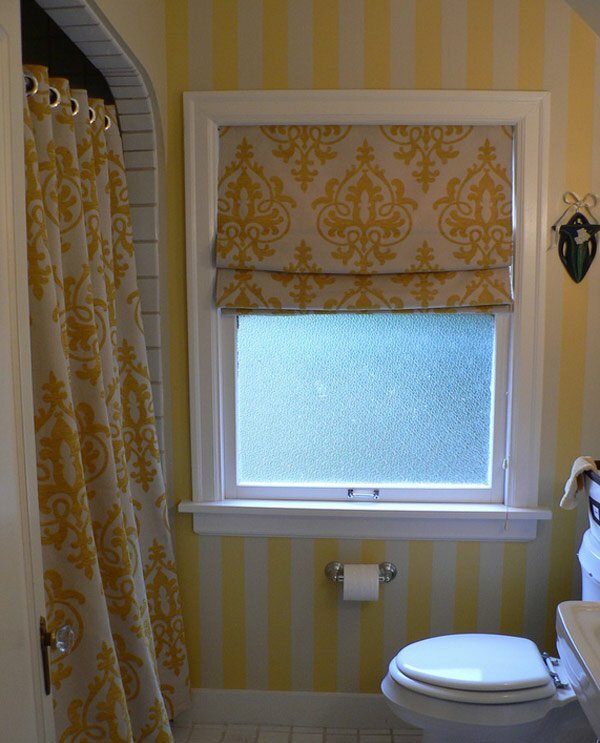 Bathroom window treatment is different from that relating room in homes. 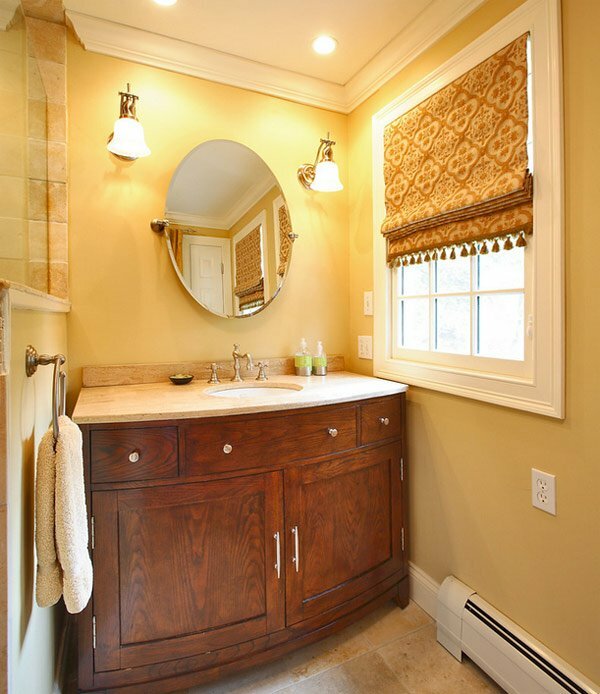 The bathroom environment is vulnerable to mold spores formation, therefore, the fabric used to decorate bathroom windows must resist the aforementioned issue. One thing you must also consider is the position of windows and the extent of daylight you want to be reflected inside. There are a lot of decorative elements you can choose from ranging from curtains, draperies, blinds, valances, shades and shutters that are functional and can serve as a crowning touch to deliver a finished and polished look. There are numerous window refinement options, a number of which are shown below. Soften the design of your bathroom by using an embroidered semi-sheer fabric to accomplish it. The room also gets a lot of morning and full-day sun. This peaceful, contemporary space, natural fiber shades were chosen to blend with grass-cloth wallpaper for a clean and organic feel. 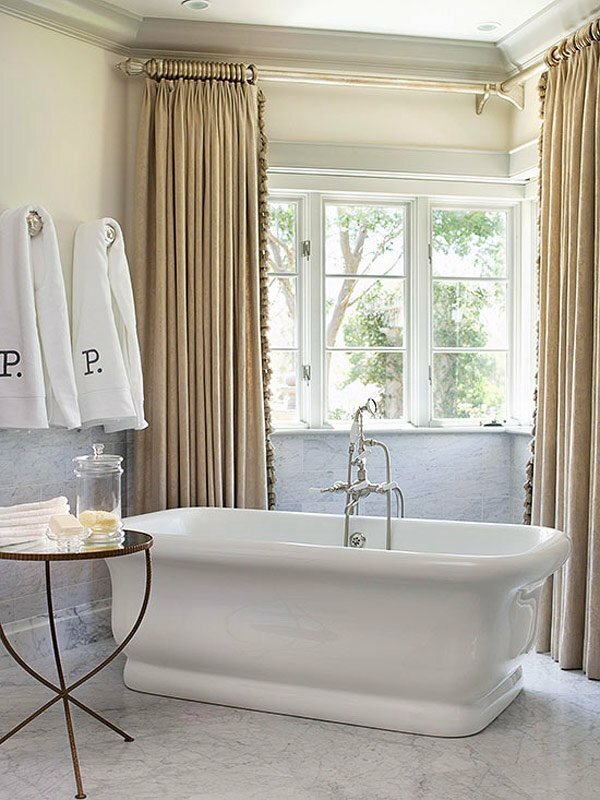 The window coverings and metallic tub balance one another within the room. 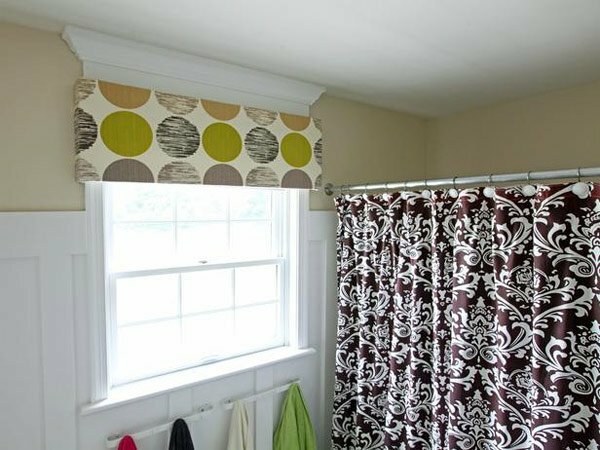 This fun fabric shades not only loosely mimics the floor tile pattern but frames out the tub area, making it feel as if it’s in a cozy corner. When shades are closed, a slight sheer quality to the fabric still allows a bit diffused light from the outside. Instead of creating a window covering, try designing the window itself. A wavy wall design is copied in the framing of this seaside window. And this is not an ordinary window; textured and stained glass are combined to create this one-of-a-kind seashell design. 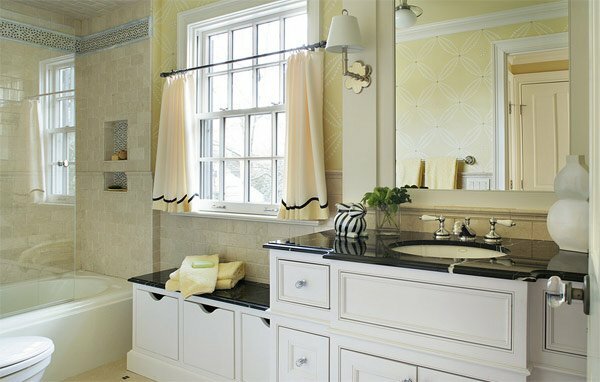 The designer topped this traditional bathroom’s window with a checkered valance, drawing attention to the window and the elegant, tiled tub. For bigger window sizes of it is more decorative to use drappies and valance, or a combination of two to make it look grander. 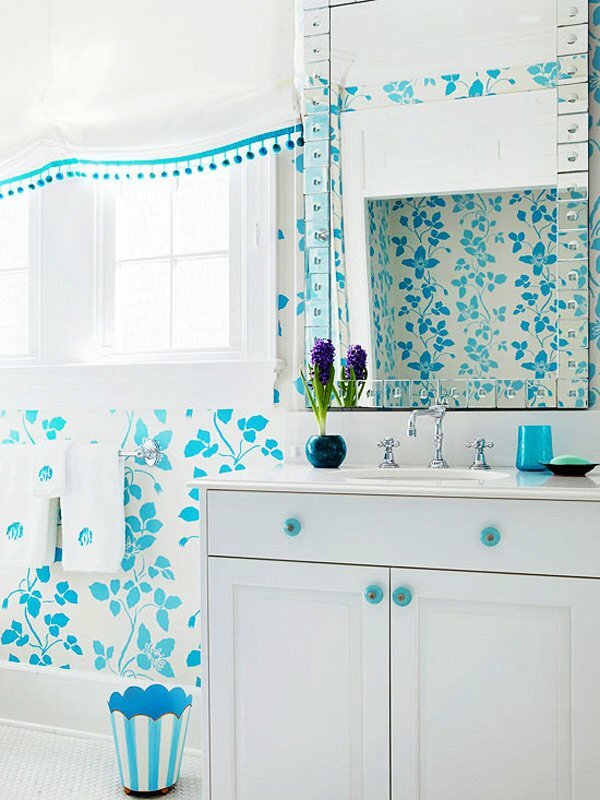 This simple touch gives a pretty girls’ bathroom a touch of drama. Small windows are dressed with simple black shade adorned with pink ribbon. If you really want to think outside the box, consider creating a window treatment for the outside. Here, an exterior patio already provides privacy, so instead of a traditional enhanced window indoors, this can give the bather a soothing water-wall view on the other side. You can style your windows by having fun with colors, creating a simple fabric-covered cornice. Keeping it flat to frame allows the molding above to remain visible as well as allowing maximum light from the window to flow into the space. This treatment still provides room for hidden blind or shade underneath for total privacy. There’s so much color in this window that you don’t notice it is covering a smaller window than the frame would suggest. In a bathroom where the window seems too small for the space, we can find a way to use creative window enhancement to fool our eyes and balance the window with the room. , in a vibrant color palette. A floor-to-ceiling curtain panel adds a graceful touch to an otherwise minimal and classic bathroom. 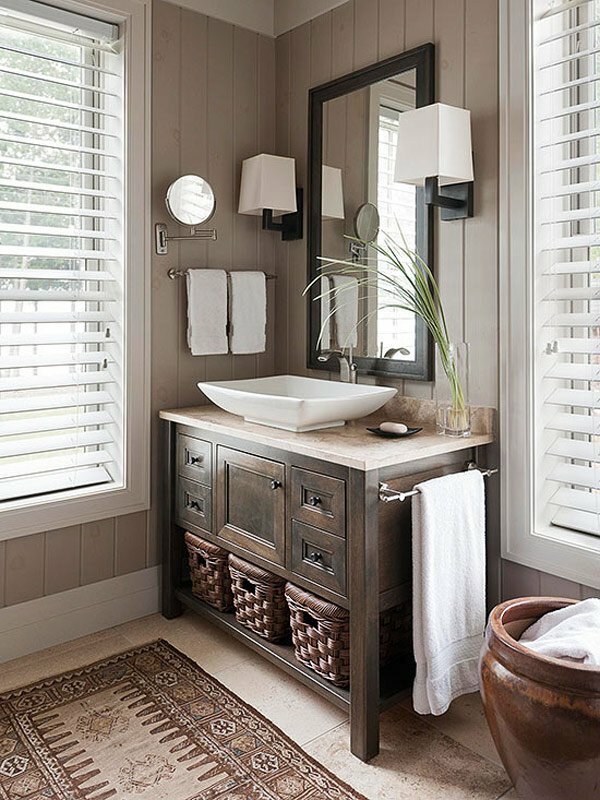 You use metallic fabrics layered with sheers making a grand appearance of your bathrooms. Create a clean and simple look. They are neat, functional and with right painted finish can withstand a damp environment. Add a luxurious touch with a soft roman shade. The blue hues of this treated window work perfectly in white bathrooms. Other blue accents create a soothing, timeless look. This window treatment of roman shade with tassel trim creates elegance to your bathrooms with a combination of vintage furniture. The shades in this bath are earthly and neutral, which allows working with many design schemes. 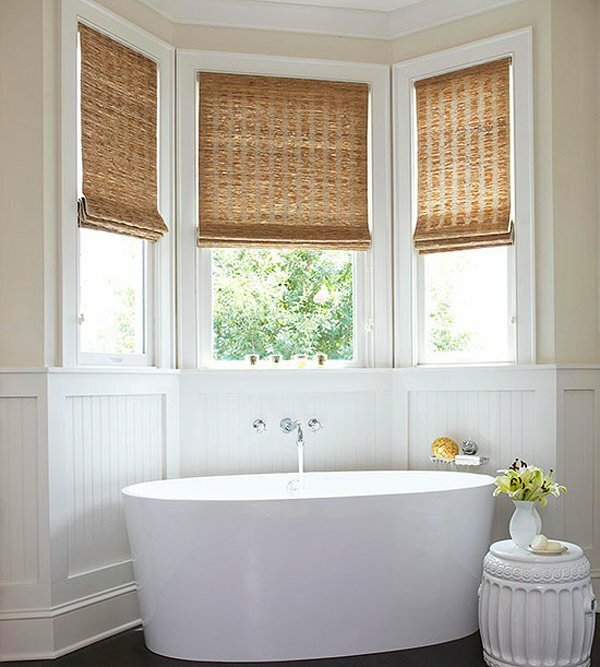 Woven shades allow bathers to control the degree of light and privacy, and they give the bath a finished look. 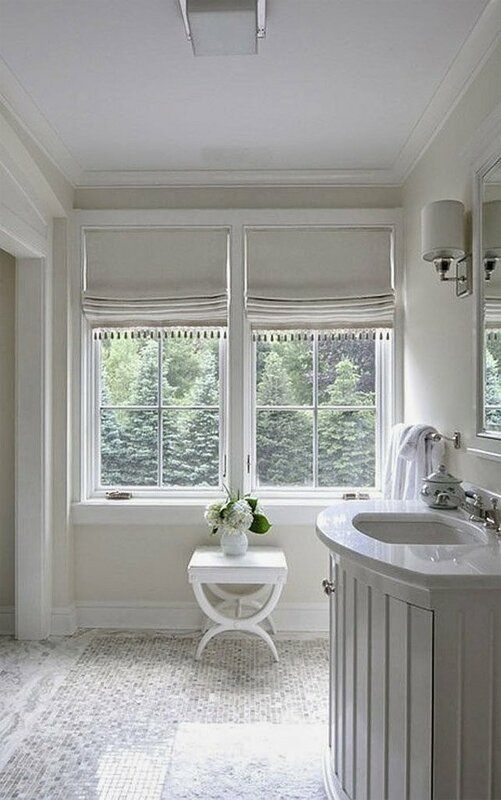 A simple cafe curtain-style window can be perfect finishing touch to an elegant bathroom. Placing the curtain covering the lower half of the window, on its counterpart, leaves the top half bare to sunlight to add sparkle. A custom shade of white looks grand when hung just at least at the ceiling rather than at the window frame creating an illusion of a larger window. With a good color combination, this simple window improvement with an accent of sheered curtain enhances the beauty of the bathrooms. Use grommets or clip rings for easy open and closing. A sweet shade with pom-pom trim adds a bit of flair to the cottage window enhancement. You can trim ribbon, fringe or tassels onto different types of fabrics for a completely different, yet dressy looks. So there, how were those ideas and designs, pretty cool huh? Have you picked your own choice of style? Not just that, also, there many things inside the bathroom that you must consider such as sinks, faucet, tiles and textures, your decorations will just be effective if it is well-blended with it. Prior to decorating, when choosing your suite, you must think that it will best suit your regime. Aside from window treatments, you can also add style to your bathroom with decorative wall tiles in different colors and prints. Wonderful photos! Anyways, the window treatments you choose will just be according to your needs and wants. You can opt for a style that will allow much natural light in or you can go for one that covers the window wholly. Either way, you’ve got a lot of materials and designs to choose from!